A pet owner said she was ‘absolutely gobsmacked’ when she was ordered to pay £1,000 for walking her dog OFF its lead – of which £500 was a fine. Jane Hurry took her beloved Alsatian, Max, for a stroll near to her home in Colchester, Essex. The mum-of-two was crossing playing fields when she was approached by a council warden who informed her she was being fined because Max, four, was not on his lead. 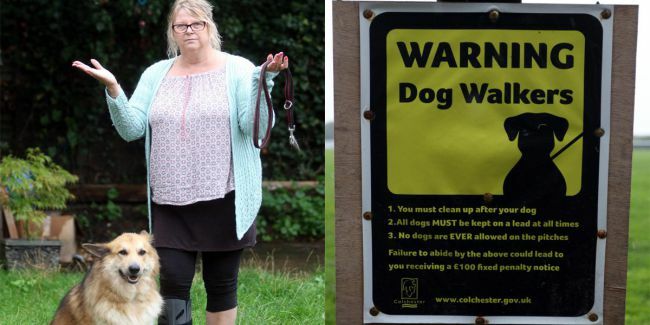 Fuming Jane said she could totally understand being fined had she failed to pick up her dog’s mess, but said she was completely unaware of the strict ruling about keeping dogs on leads. Unfortunately for Jane, 54, she recently moved home and was unaware of correspondence ordering her to appear before magistrates last week. As a result she did not attend court and was fined a whopping £500 in her absence, along with £450 costs and a further £50 surcharge. Jane today called for council jobsworths to instead entirely ban dog walking from the playing fields where, Colchester Rugby Club play. She said: “I was walking Max across the playing field when I saw the council chap getting out of his car. “It was tipping it down with rain and I was walking between a couple of the pitches – not on the fields of play.